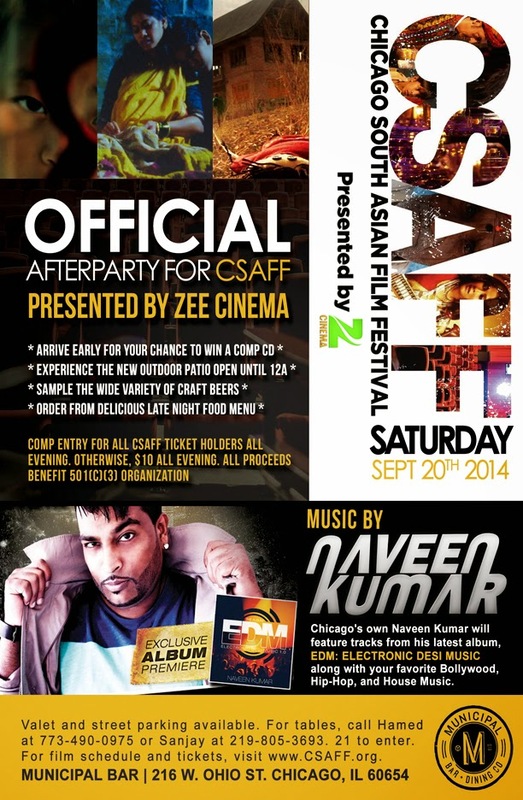 ABCDchicago: Official After Party for CSAFF, presented by ZEE Cinema! Official After Party for CSAFF, presented by ZEE Cinema! Chicago's own Naveen Kumar will feature tracks from his latest album, EDM: ELECTRONIC DESI MUSIC along with your favorite Bollywood, Hip-Hop, and House Music. - Arrive early for your chance to win a Comp CD. - Experience the new Outdoor Patio open until 12a. - Sample the wide variety of Craft Beers. - Order from delicious Late Night Food menu. Comp entry for all CSAFF ticket holders all evening. Otherwise, $10 all evening. All proceeds benefit 501(c)(3) organization.